Visual Appeal. This is the obvious reason for fixing a powder coated finish. To most customers, if it doesn’t look right, it isn’t acceptable. Performance. Some powder coatings are purely functional, so they don’t need to be aesthetically perfect. Usually there are one or more standards (such as corrosion resistance) that have to be met. A defect can compromise the finish integrity and cause a part to fail to meet a specific customer’s standards. Warranty. If the powder coated part has any sort of warranty, then special care should be made to make sure the part passes end-of-the line QC testing. A part may look great and have no apparent defects, but if it does not pass the customer’s minimum testing standards, a repair or rework is needed. When Is The Right Time To Do Touch-Up Work? The best time to catch your coating mistakes is prior to curing the powder. The powder can easily be blown off with compressed air or wiped off and then reapplied with very little hassle. Get in the habit of checking your parts for application errors before you start the curing process. Every mistake you catch here will save you time, effort and money later. Many manufacturers use color-matched liquid enamels to cover hook marks, missed areas, Faraday areas, re-welds, sanded spots, handling damage and other defects. Usable with most decorative finishes. This repair method is fine except for on the primary surface a customer can see. In some instances, your powder process can allow for a repainted finish to go over a previously painted part with no prep work. Usually the part must be freshly powder coated with no contamination on the surface. Some chemistry is not compatible with this method and the surface will need to be abraded (blasted with abrasive grit or scuffed with sandpaper) and then wiped down with alcohol. If the part has been cured for more than a week, it will almost always need to be abraded and cleaned before re-coating. Many small parts manufacturers will re-run parts after inspection if they have light powder coverage or other easily repaired surface defects. In the closet hardware and racking industries it is especially common for facilities to repaint parts once or twice if they are having an acceptable amount of rejects. Sanding and buffing the powder finish can eliminate surface trash and some defects. This also helps smooth out orange peel that naturally occurs with most powder coatings on parts where the powder thickness is excessive in a particular area. Sanding companies like 3M have a series of abrasive and buffing compounds that allow shops to sand out defects and then bring the surface back to a smooth shine. In the automotive and other transportation industries, manufacturers will sometimes sand and buff out Class A type parts such as hoods or panels that need to have a mirror-like defect free finish. This is similar to work done with wet paint. It takes some experimentation to develop a successful sanding and buffing process. Tip: The sooner you buff after curing, the easier it is to work with the finish. Power coating gets very hard 1-3 days after curing. There are many products like Bondo and Lab-metal that can be used to fill gaps and seal holes prior to powder coating. 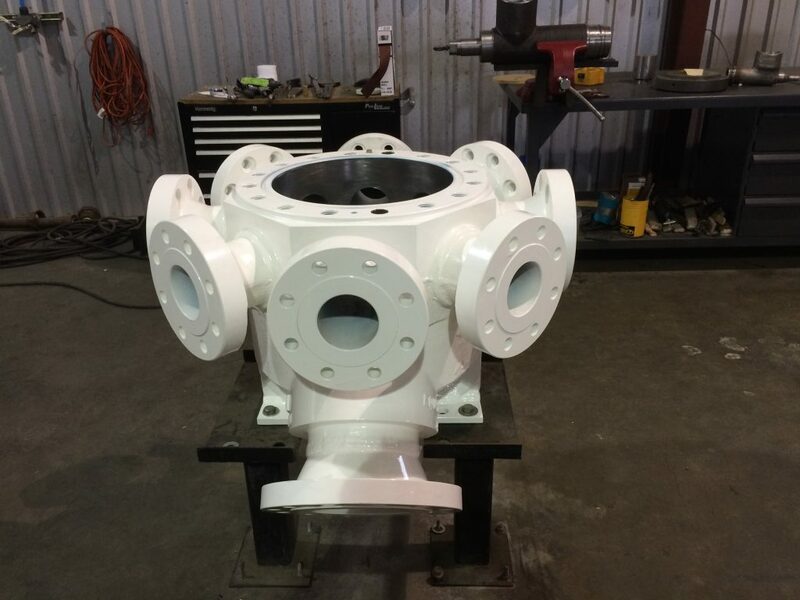 Before adding a filler to your process, make sure it is compatible with 400° to 450° F curing temperatures and that it is recommended for powder coating. If there is a catastrophic finish failure, starting over after taking the finish off down to the bare metal can sometimes be the only solution. Major powder coating issues, like severe adhesion problems in high-performance parts, often require a total repaint. Pretreatment failures, parts contamination after pretreatment, underbaking, and overbaking can also cause problems that are so bad that the only answer is to totally strip the coating off and redo the process (after you have identified and corrected the fault in the process). Remember, the finish is only as strong as its weakest layer, so if you notice flaking once the finish is cured, it will need to be completely redone. For demanding projects like government contracts, high-performance industrial components, engine parts, military equipment, parts that will be exposed to a highly corrosive environment or impact/abrasion in the field, the only way to insure quality compliance for parts that have badly defective finishes is to re-work the parts down to the metal. We’ve just outlined the most common touch-up and re-work methods, but there is another technique that can sometimes get positive results. An uncommon method for fixing small finish imperfections is to put a small amount of the powder in a clear lacquer and use it as touch-up paint. It’s possible to use hair spray, nail polish and other lacquers in a hobby situation, but bulk materials will be needed in a professional environment. Although the touched-up area will visually match the cured powder paint, the repaired area will not have the same durability as the cured surface. Remember, if you need the same surface integrity and durability in your touch-up areas as you do with the powder coated finish, you will probably need to use a two-component catalyzed topcoat and possibly a zinc-rich epoxy primer for appropriate corrosion resistance. To retain business and keep customers happy, you need to know exactly what each customer expects from the powder coated finish you are providing. Once you know that, you can develop a process that includes a repeatable touch-up system that addresses defective finishes of all types. Proper touch-up and re-work techniques help ensure great finished products. Using professional quality equipment can solve many of your coating issues, including overbake and underbake problems associated with outdated or inferior quality ovens. All of Reliant Finishing Systems’ equipment is designed to provide the best finishes possible for today’s powder coating operations. Find out more about Reliant equipment here, or give one of our systems specialists a call today. This entry was posted in News on July 6, 2016 by Bruce Chirrey.